President Muhammadu Buhari has signed nine different agreements including the Extradition Treaty between Nigeria and United Arab Emirates (UAE) toward strengthening Nigeria’s anti-corruption campaign. Speaking at the agreement signing ceremony at the President Villa, Abuja on Thursday, the President also said that the agreements signed would enable both countries to take important steps toward strengthening their economies and security. “Today’s ceremony marks a very important milestone in our demonstration of sovereign capacity to fulfill our international obligations and take important steps for the benefit of our economy, security and the anti-corruption war within and outside Nigeria. “I am happy to note therefore, that pursuant to a Memorandum presented to the Federal Executive Council by the Honourable Attorney-General of the Federation and Minister of Justice, Council has approved the ratification of the said Agreements, thus paving the way for today’s ceremony. 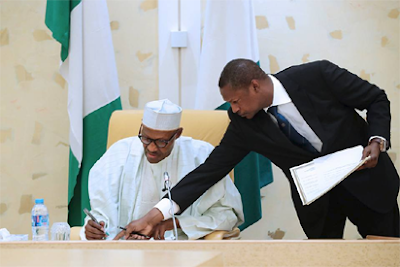 President Buhari, therefore, charged all agencies with roles to play under the respective Treaties to ensure that they did that effectively to reap the full benefits of the agreements.